Not surprisingly for a country with such a rich and vivid history, you are never far from the past in Wales. The Story of Wales is a fascinating journey through time exploring the places where history was made. Led by one of Wales’ experienced official guides and qualified historian, it brings the past to life in the wonderful Welsh landscape. Unearth prehistoric mysteries at the burial chambers and standing stones of lost cultures stretching back thousands of years. Discover our Celtic ancestors and explore one of their hillfort strongholds. Learn to speak some Welsh (Cymraeg,) a Celtic language and one of the oldest in Europe. Follow in the footsteps of invading Roman legions at Wales’ finest Roman sites and see how their influence is still with us. Learn how Wales (Cymru) emerged from the collapse of Roman Britain and how Wales’ most famous legend, King Arthur, was forged in our struggle for survival. Visit the site that inspired the story of the Round Table. Brave the battleground of medieval Wales, the ‘Age of the Castle’ and discover why Wales has more castles per square mile than any country on earth! Visit a mighty ‘masterpiece in stone,’ learn about life inside and how to defend and attack a castle. Hear about Wales’ greatest national hero- the rebel prince Owain Glyndwr, the rise of the cunning Tudor family from Welsh gentry to royal dynasty and how Wales became embroiled in England’s Civil War. See how Wales became the world’s first industrial nation, the ‘Cradle of the Industrial Revolution’ and a cauldron of rebellion as people battled for rights and freedom in Britain’s last armed uprisings. Go underground in a real coal mine to experience where men, woman and children toiled for the ‘black gold’ that powered the world. 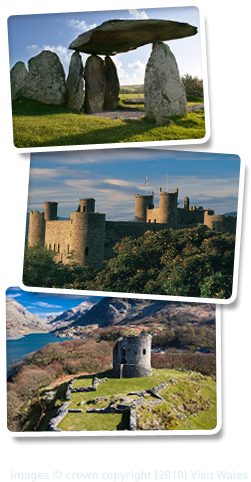 The Story of Wales is a full day tour, running throughout the year. It can also be extended to several days to explore further through Wales and can be tailored to suit particular interests such as, Prehistoric Wales, Celts and Romans, Castles of Wales, Industrial Heritage, The Chartist Rising etc. Early booking is strongly recommended on this acclaimed and popular tour.